I decided to try a Braided Spine binding for this book. So it has a wrap-around leather cover with a wrap-around strap. 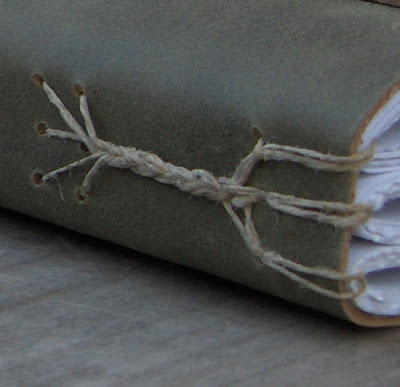 Then it is bound with three separate threads (and six needles) which wrap the head and tail of the book, then all the threads wrap around each other as they are braided on the spine. I really like the look of this and many of the other 3-section bindings that Smith has devised, although I don't like restricting my books to 3 sections since they are usually journals and people like having lots of pages.... I suppose it could be doubled to have six sections so there would be two sets of braids... can't quite imagine doing them simultaneously with 12 needles on the go... now THAT would be a challenge for sure! Thanks Jackie for making me do something new again this week! Looks pretty good, Rhonda! I like the kind of leather you used. Can't you just make the signatures thicker by taking more sheets into them instead of increasing the number of signatures? Very nice book Rhonda. I agree with you that such thick signatures could have been clunky but they look really rustic in this binding and the sewing suits perfectly. Now I feel the need to try the 12 needle sewing. I think 8 is the most I've ever used in a plain coptic and that needed a lot of concentration. I love the challenge of Keith's instructions. Is this binding in book 2 non-adhesive bindings? I love its look & would like to give it a try. I've only got book 3 at the moment though. AS I mentioned in the comment just above yours, it's in Keith Smith's book. 1, 2 & 3-Section Sewings' book ? is the book ur referring to IN UR previous commment rhonda? im sorry if this may be a stupid question but i did buy that keith smith book and i have read the instructions to the braid spine stitching and i am alil stuck i suppose. i am pretty new to the crafting i wanted to practise to make sure i understood before i do it i dont quite understand how you get that loop before the stitching really begins could someone maybe explain it in an easier way or show me a pic cuz i dont quite get it how its written. the book i am planning on making is 3 signatures i havent worked out how many pages yet. any help or easier diagram would be greatly appreciated. i figured out my problem. my project should be interesting i will post up my results. 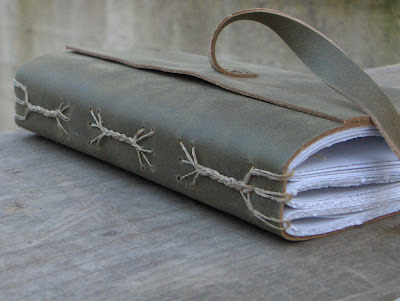 I just finished making this binding, and wondering if you used waxed thread. If you've made more than one, since 2008, maybe you've tried it since then. Just curious, as I'm going to give it a try with waxed thread. Hi Mar, yes I have done this binding many times now. And I always used waxed thread. If you have only unwaxed, get some beeswax and wax it.